I'm in full nesting mode over here. I'm running around like a crazy chicken trying to complete a totally random to-do list. And my poor husband is being a real trooper with all my panicked calls like "WE HAVE 2 BOY OUTFITS AND 3 GIRL OUTFITS AND THAT'S NOT EVEN!" Seriously, guys, I'm a gem when I'm pregnant. But besides washing the baby clothes, prepping the diapers, and generally tearing this house apart, we really want to prepare B as much as we can for his his new role as a big brother. One thing we're trying is a baby doll. We took him shopping to pick one out and have been working on things like being gentle with a baby and telling him mama's going to have a baby too. We'll see if it helps. But a certain little boy realized right away that baby doll was missing something important - and insisted it wear one of the baby's diapers. Ha. 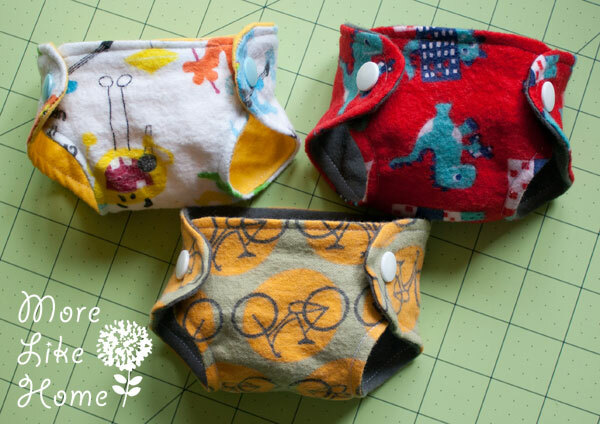 So I whipped up a couple little diapers just for baby doll. 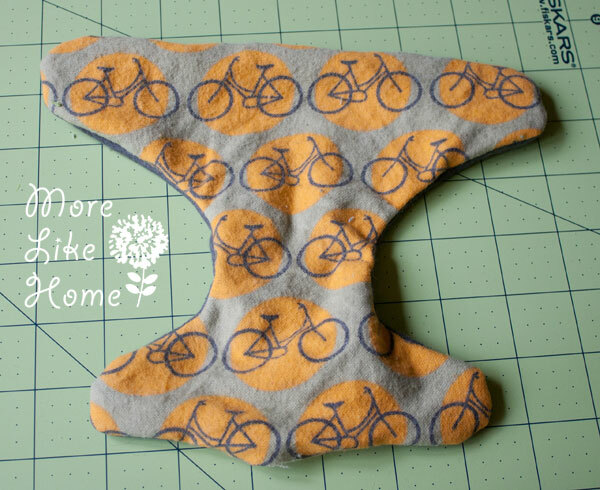 pattern - download it and make sure your printer doesn't "fit to page" or your sizing will be off. check that the box on the page is 1" after printing. 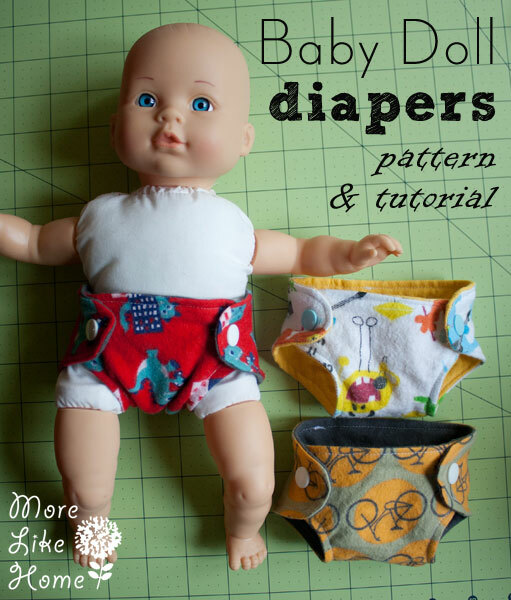 These diapers fit our basic 13" tall baby doll. Start by cutting out the pattern. 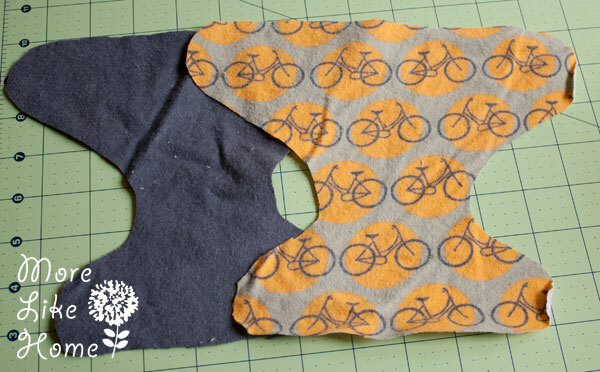 Use the pattern to cut out two pieces of fabric, one from the outside fabric and one from the lining. 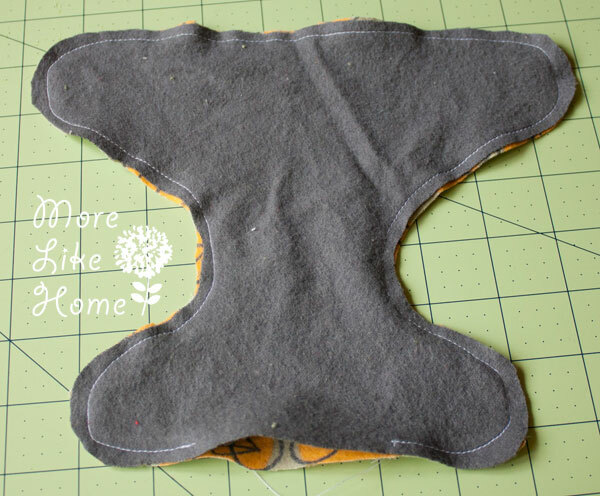 Stack the pieces right-side together and sew a 1/4" seam around the edges, leaving an opening at one end for turning. 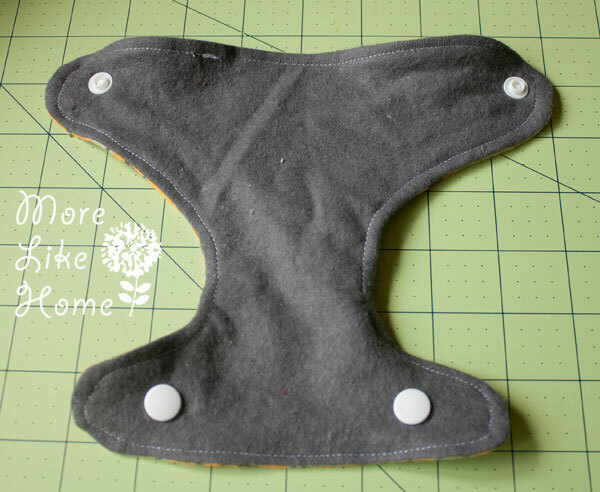 Flip the diaper right side out. Use your fingers to poke out the flaps. 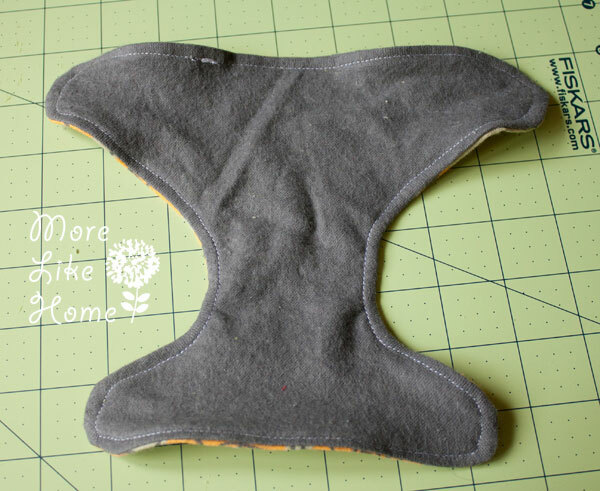 Next add snaps or velcro at the points marked on the pattern (check the fit on your baby doll first to make sure you get a good fit at that point, if you baby is wider or thinner you can adjust the placement). I used snaps because I already had them and they are easy to put on (I get them here) but then I was like "duh, B won't be able to snap these on his own" so I think I'll go back and add some velcro too. Try it on! Like I said, these diapers fit our 13" baby doll so I assume they would fit most that size. If you have a different size doll you could try sizing the pattern up or down on your printer. Now go ahead and make a set! 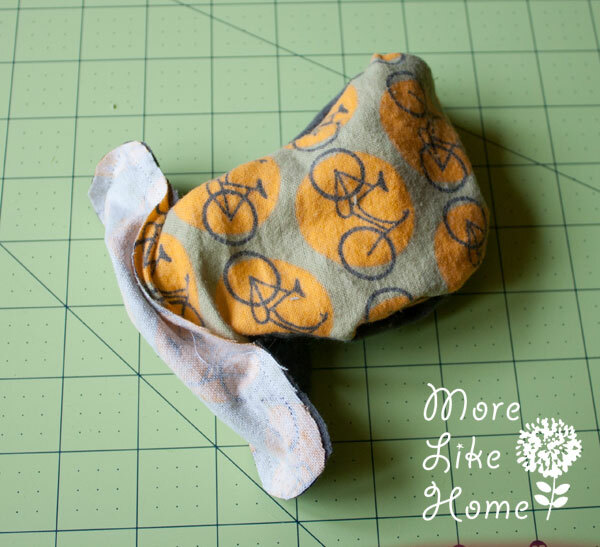 Have you made anything for a baby doll? How do you prepare your kids for a new baby? One of the things I would suggest you make for the doll is a baby carrier. 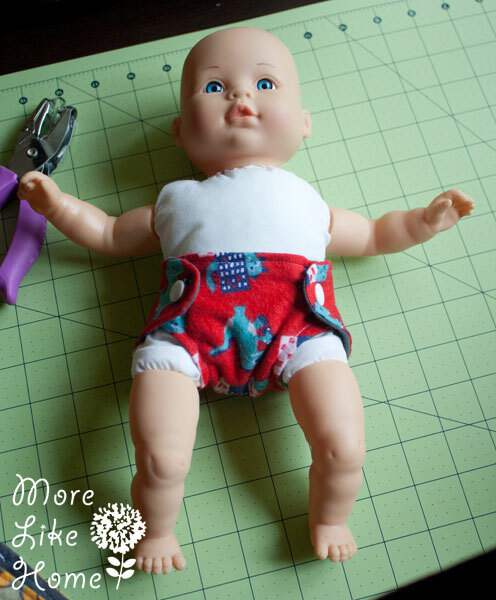 I haven't made one yet because again, drawing challenged, but if you plan on wearing your baby at all it might help your little one feel included if they can wear their doll also. I found some cute tutorials on Pinterest but have to see if my husband, don't laugh, can draw the pattern for me. Good luck with your new arrival. awesome, easy pattern. 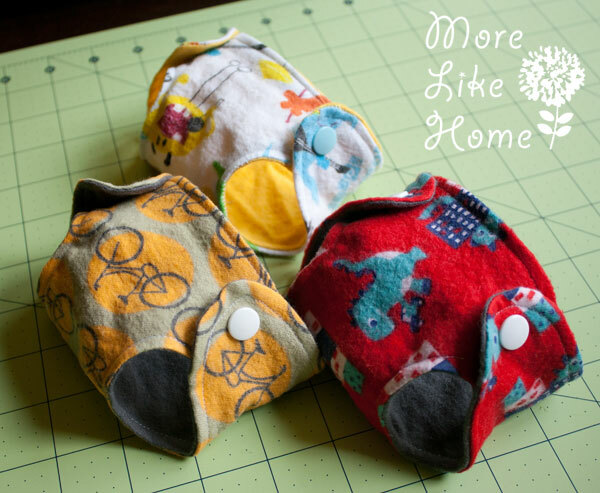 My kids preschool always asks for disposable premie diapers at the beginning of the year but i might make up some of these with scraps instead. I'm in a different preschool class and found dolls with no diapers or clothes. 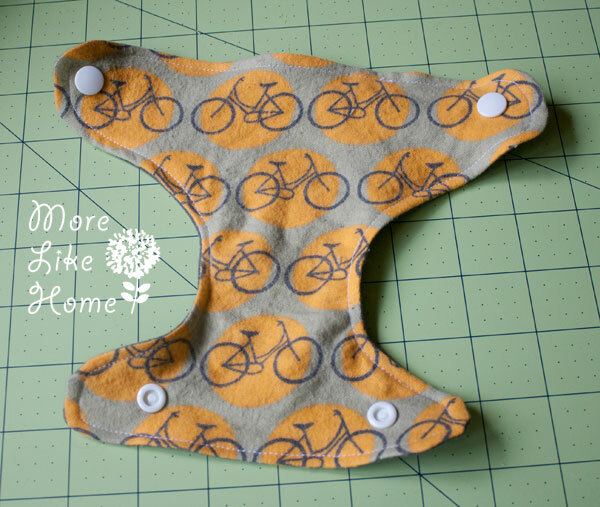 I can't justify spending the money of plastic diapers but I will be making diapers this weekend! Thank you.